Their color motif is minimal—bold swatches of red and white—while the tracks, preened with an underlying influence of the blues, achieve a rousing fullness by mixing hues culled from the best samplings of the basics. Utilizing primitive equipment and recording devoid of computer enhancement, The White Stripes kick it old school. Nevertheless, veering clear of a rote exercise in nostalgia, the band inlays progressive flourishes that create a seminal LP, eschewing staid convention and reinventing American rock at a point when jaded fans could have insisted they had heard everything. Going retro for the band’s duo, Jack White and Meg White, represents less about getting stuck in a time warp than about bending the past into an emerging future. Twangs from the Mississippi Delta, punk beats, guitar solos rivaling the intensity of Led Zeppelin's greatest riffs, and male vocals, at times reaching Freddy Mercury highs, join together in a fusion of sonic nirvana. Stripped down, this is a lo-fi affair on a grand scale. Paying tribute to prior artistic groundwork without getting entrapped by it, the album also thematically scrutinizes personal histories. A CD insert dedicates the work to the death of the sweetheart. Jack and Meg’s own relationship, for an extended stretch a source of deliberate rumor, stirs suspicious memory but tints the lyrics with integrity. Acrimony begs reflection and, ideally, the desire never to repeat the past. 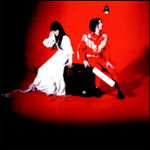 The band's sophisticated presentation of the material affirms The White Stripes do not think like copycats. They are exiles from former decades, living in the now, writing for tomorrow and incorporating a knowing experimentation with form. Out of admiration for the unique synthesis, garages are cleared by budding musicians in quiet suburban neighborhoods, making room for drum sets, amplifiers, microphones and guitars to unleash burning talents. A new generation prepares to sing. Imitation, as the saying goes, is the sincerest form of flattery, unless adulation lacks the wherewithal to establish a unique brand apart from hackneyed knockoffs. The Stripes own their style, and the goods rock on, destined for antiquity.